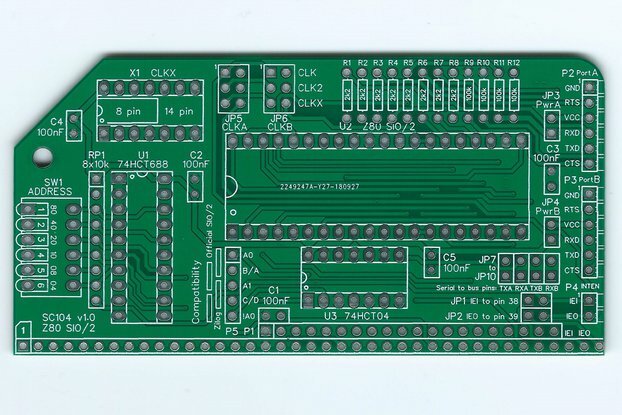 The aim of this design is to make entry into the RC2014 universe easier and more reliable, by using fewer components, less soldering, fewer configuration jumpers, and fewer circuit boards. 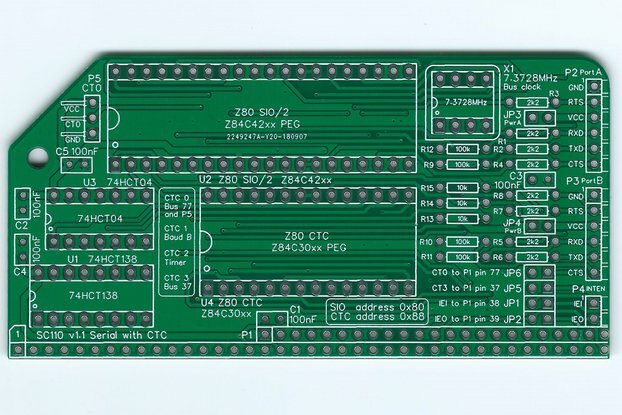 This motherboard can work in a modest way as a single board computer (SBC), yet can easily be expanded to run CP/M and more. 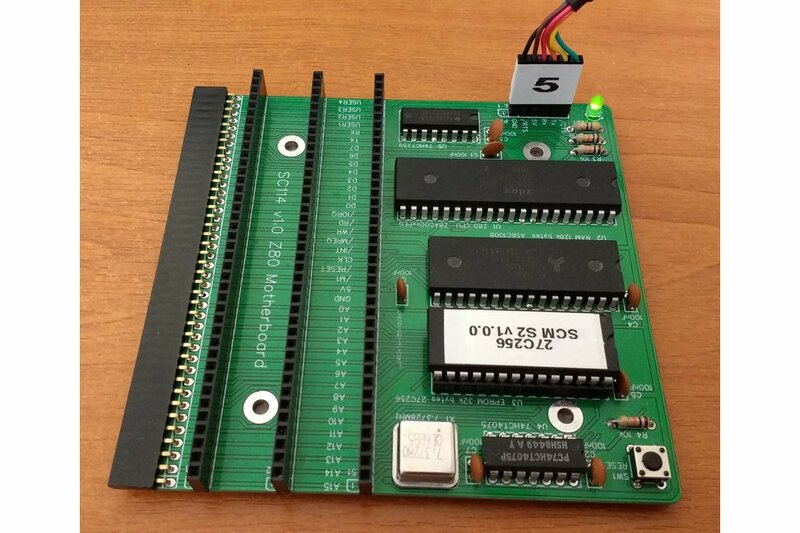 The idea is that you can build the board without even fitting those tedious RC2014 sockets, then test it with the simple bit-bang serial port. This only involves assembling the components shown in the close-up picture above. That's 5 chips + oscillator + 6 pin header + a few Rs and Cs + LED + reset button. 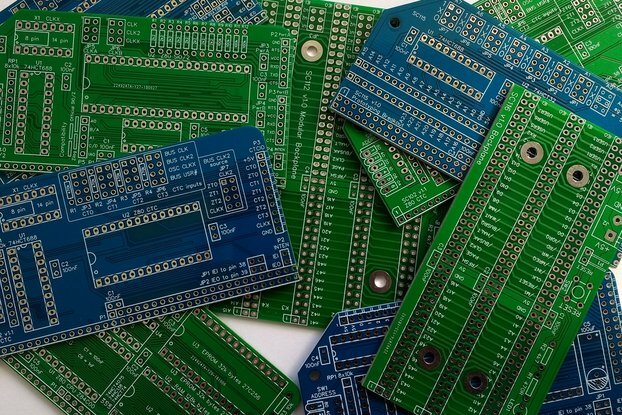 It looks like this takes about 175 solder joints. This sounds a lot but is way fewer than a typical RC2014. There should be a good chance of such a simple circuit working first time. If it doesn't work then it is a relatively simple circuit to troubleshoot. The onboard LED can flash results of the self-test, so a serial port problem will not look like a dead processor. 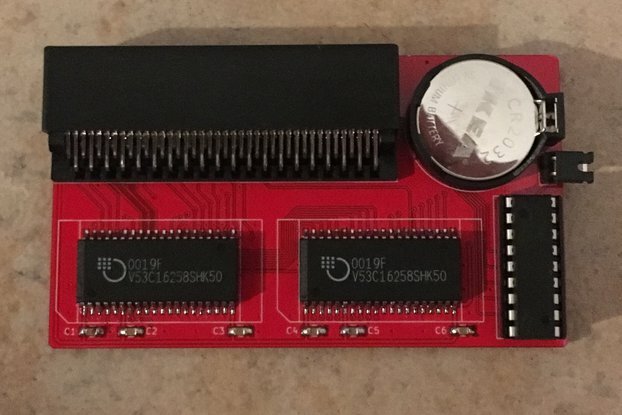 You can then add the four 40 pin RC2014 module sockets. 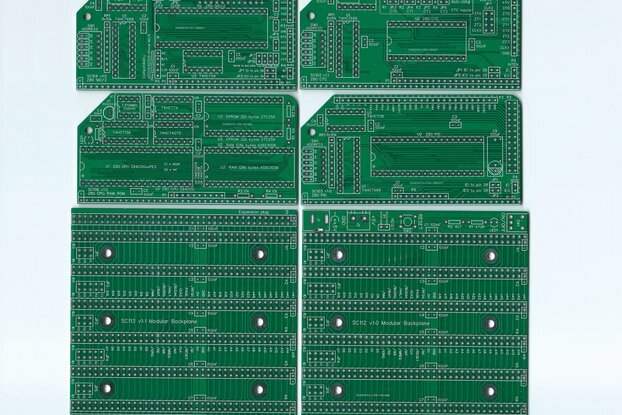 So that's a further 160 solder joints, but it is incremental assembly thus relatively easy to work out where any new fault is. 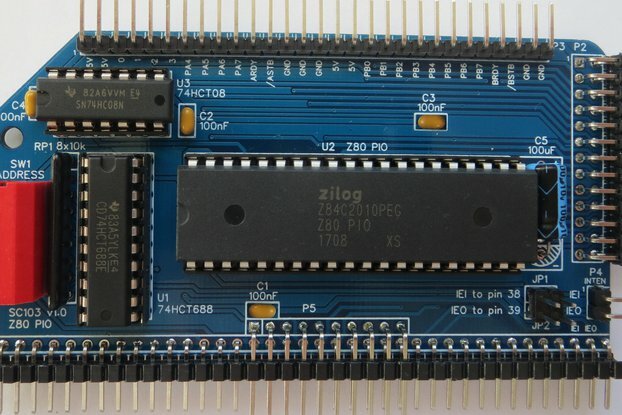 The next step would be to build and test a proper serial port, such as the official Z80 SIO module. Then, if you want CP/M, all you need to add is the official Compact Flash module and a Compact Flash card with the standard RC2014 CP/M distribution installed. All this is supported by the ROM with no configuration required. 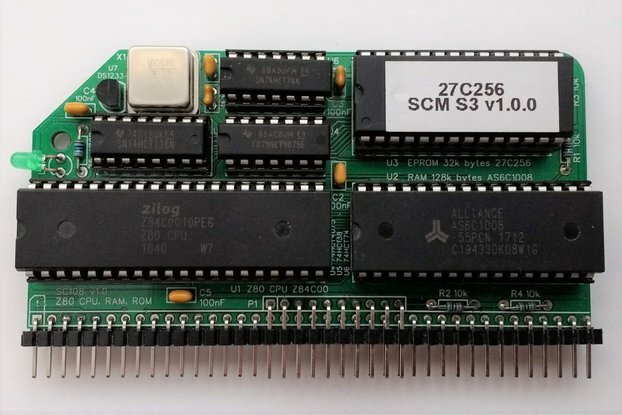 You can even add backplanes from the modular backplane range, although their functionality is limited by the single row standard 40 pin expansion socket on the motherboard. The motherboard has relatively few components and is thus quite a cheap build, so if it does not prove expandable enough it is not a big deal to discard it, take the useful modules and move to a Pro-style system. The kit contains everything you need to build the motherboard, except solder, tools and cleaning materials. 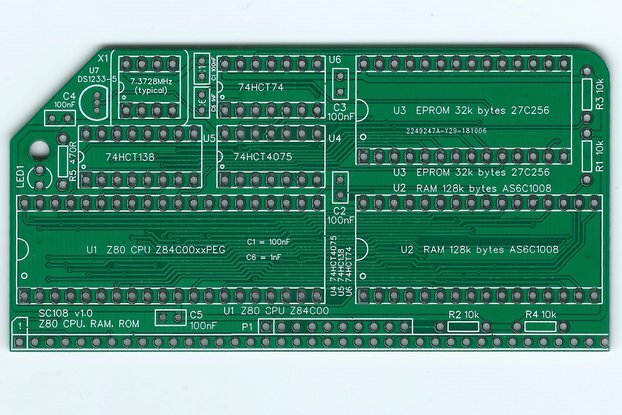 To use the completed motherboard you require a USB to serial adapter (5-volt power and 5-volt signals), a computer, and a terminal program, such as Tera Term. If you have any doubts about sourcing a suitable USB to serial adapter, you might like to include this option with your kit. This product has a user guide and an assembly guide. The Small Computer Monitor has a user guide and a detailed tutorial. These documents can be found at www.scc.me.uk or by following the documentation link below.